As it's generally understood, the word gnocchi refers to a variety of Italian dumplings made from potatoes and flour. Indeed, the word gnocchi (pronounced "NYO-kee") means "dumplings" in Italian. And yet all gnocchi are not Italian—and they're not all made with potato. There's a version of gnocchi in the French culinary tradition that is made with choux dough (which is what pastries like cream puffs and eclairs are made of) instead of potatoes. Another not uncommon variation of gnocchi is made with spinach and ricotta cheese, plus some flour, and egg yolks to bind it all together. With that said, however, most of the time you come across gnocchi, it's going to be the Italian-style kind that's made from potatoes. And if you're lucky, it'll be freshly made, which is the best way to experience gnocchi. You can find frozen gnocchi sometimes, and they're OK in a pinch, as well as the packaged variety, which are dense and doughy. Plenty of Italian restaurants serve freshly made gnocchi, and here in Portland, a plate of it will set you back $18. Fortunately, you don't have to be a millionaire to enjoy a plate of gnocchi. You can make it yourself, and it is fairly simple. You'll need a something called a potato ricer, which is a tool, like a potato-sized garlic press, that takes cooked potatoes and squeezes them into a loose fluffy mass. You want that consistency so that the gnocchi will be light and fluffy. Mashing or puréeing releases too much starch from the potatoes, and causes the gnocchi to be gummy instead of fluffy. The cooked potato is then mixed with flour to form a dough, which is then flattened and sliced into strips, which are in turn rolled into cylinders, then cut into individual dumplings. 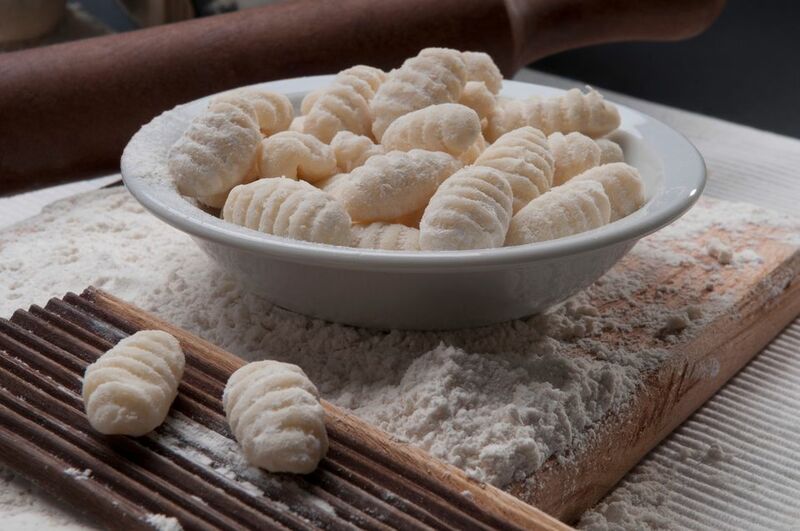 Traditionally gnocchi are pressed between the thumb and the tines of a fork to make the characteristic indentations in the dumplings (although some cooks just use their thumbs and skip the fork altogether). There are also special gnocchi boards with little ridges on them for pressing the marks into the gnocchi. Once they are cut and shaped, the dumplings are simmered for a short time. When the gnocchi float to the top of the cooking liquid, they're done. They're typically served as a first course, There are a number of sauces to serve with gnocchi, and they pair particularly well with a simple pesto sauce. Here's a basic recipe for gnocchi. What it involves is steaming the potatoes, then mashing them in a ricer and adding some all-purpose flour to form a dough. You'll roll the dough into long cylinders, cut the cylinders into short sections with a sharp knife, shape them with your thumb and/or a fork, then briefly simmer them until they turn fluffy and float to the top of the pot. As mentioned earlier, the word gnocchi means dumplings in Italian, and it happens to be a plural noun. The singular would be gnoccho. Thus it's correct to say "gnocchi are..." as opposed to "gnocchi is..." We try to adhere to that convention, even though it can be difficult and awkward sometimes.